Yoga NidraDream Yoga, Sleep Yoga, Psyche Yoga.....is truly magical. Do you have trouble sleeping? Are you suffering from stress, chronic pain, anxiety? Are you turned off by physical Yoga?Are you suffering from pain?Do you wish to improve your memory or/and unleash your creative self?Are you interested in personal growth and developing your spiritual potential? These online monthly classes will take place on the first Wednesday of the month. 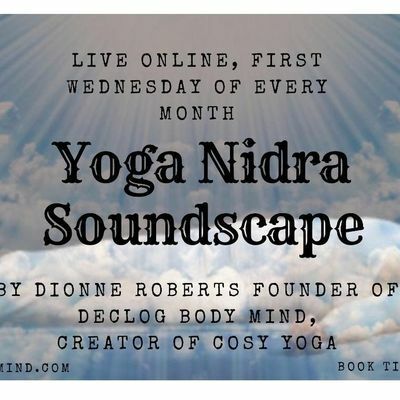 They will give you the opportunity to enjoy Yoga Nidra in the comfort of your own home and it will make my teaching accessible to you all. Anyone can do it! - it involves no No movement, No stretching, No strengthening – and it’s easy to incorporate into your life. What is Yoga Nidra for? It sooths your body: your nervous system, aches and pains. It aids your concentration/memory and with unleashing your creativity. It supports your personal growth and spiritual development. In my repertoire you will hear sounds from either: shurti box, singing bowls, percussion instruments or shamanic drum. These musical instruments will be used either as sound effects to enhance the theme of the Nidra or in a mini Sound Bath. All you need for this class is to make yourself comfortable by either lying down on your bed or on the floor; or sit in a comfortable chair (preferably reclined at a 45 degree angle). Make sure to have as many cushions and blankets necessary .Some of you may want paper and pen nearby to doddle your findings after the call. Please use the time zone converter here to check to see if live event is suitable for another country, although you will have acess for some time afterwards.